The number of pupils with special educational needs (SEN) has increased from 1,228,785 in January 2016 to 1,244,255 in January 2017. While this is the first annual increase since 2010, the percentage of pupils with special educational needs remains stable at 14.4%. The SEN figures started to fall after 2010 in the wake of the Ofsted report which said almost a quarter of children on lower levels of SEN were misdiagnosed and just needed better teaching and proper pastoral support. Is this trend starting to reverse? 242,185 pupils have a statement of SEN or an Education, Health and Care (EHC) plan. This is an increase of 5,380 since January 2016, but remains equal to 2.8% of the total pupil population. A further 1,002,070 pupils are on SEN support. This is equal to 11.6% of the total pupil population and remains unchanged since January 2016. The percentage of pupils with SEN without statements or EHC plans attending independent schools has gradually increased each year. 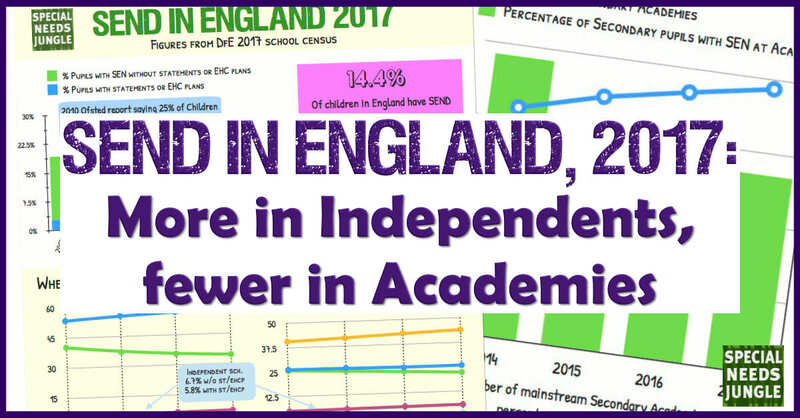 In January 2010, 4.0% of pupils with SEN without statements or EHC plans attended independent schools and this has increased to 6.7% of pupils in January 2017. Whether these are Independent Special, Specialist or neither is not clear but it does raise the question of why many parents do not have faith in local authority special provision - and it is very possible that there isn't any suitable. This is often the case for children with high functioning ASD/Aspergers. Pupils with special educational needs remain more likely to be eligible for free school meals. 26.6% of pupils with special educational needs are eligible for free school meals compared to 11.8% of pupils without special educational needs. Pupils with statements or EHC plans are more likely to be eligible for free school meals than pupils on SEN support (31.4% compared to 25.4%). Special educational needs are most prevalent in travellers of Irish heritage and Gypsy/Roma pupils with 30.8% and 26.9% respectively. Travellers of Irish heritage and black Caribbean pupils had the highest percentage of pupils with statements or EHC plans (4.4% and 4.0% respectively). Indian pupils had the lowest percentage of pupils with statements or EHC plans at 1.8%, compared with 2.8% of all pupils nationally. "Prior to ‘SEN support’, schools were required to record, on the census, a primary type of need only for those children and young people at ‘school action plus’ or with statements, but not for those at ‘school action’. It is very likely that the primary type of need would have been known for the majority of those children and young people ahead of previous census dates. This time around, we think ‘SEN but no specialist assessment of type of need’ numbers may well include a number of children who are receiving support that is additional to or different from that made for most pupils but for whom it has not been possible by the time of the census to establish a definite primary type of need. This may be because specialist advice has not been sought. In January 2015, 28,490 pupils were in this category. Whoa, there... In 2015, 28,490 and two years later, the figure is 13k higher? What's going on? So, okay, the DfE's reasoning sounded plausible back in January 2015; those children who may have been on School Action but who hadn't had any kind of assessment - sort of 'bung in a bit of this and that and keep the parents quiet', kind of thing. But now, in January 2017, why are there so many more children still in this category? Are they new children undergoing initial assessment or are they still the old SA-type kids who have not yet had one at all (and may never get one)? These cannot, presumably, be transfers to EHCPs as these children will have already had their SEND categorised when they got their statements. So these most be children who have some kind of support, but as no one knows for sure what the problem is, it may be suitable or not (depending on the skill of the teacher or SENCo, presumably). And what about those who have a statement of EHCP in this category? Please, someone enlighten me as to how this can be so as I'm flummoxed. And the shocker we all really knew about? The number of Academy schools is rising year on year. 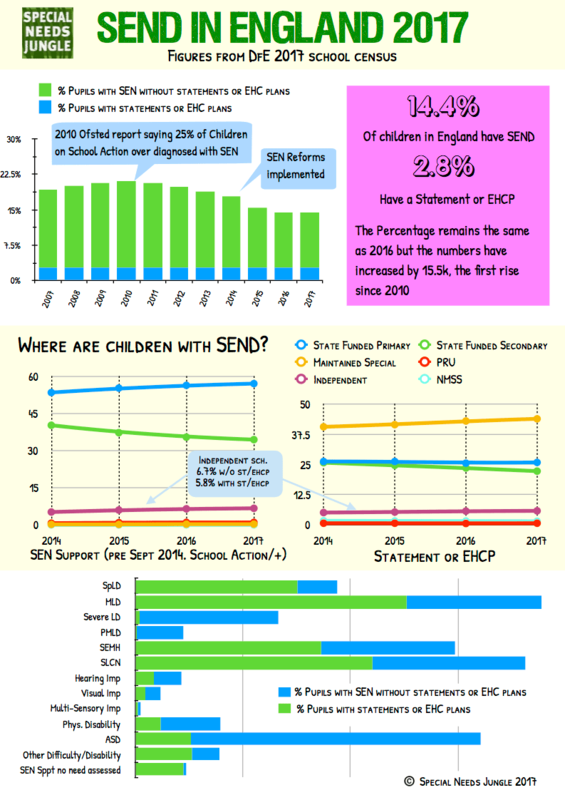 In Primary years, the percentage of children with SEND has stayed relatively stable. In Secondary years however, the reverse trend is true. There were 432 more Academy schools by January 2017 when the census was completed than there were in the same month in 2014, just before the reforms became law. Back then, there 17.3% of children in mainstream Academies had some type of SEND. This was pretty much in line with the national picture as it had been in previous years. Just three years later in January 2017, that percentage had dropped to 12.1%, two percent below the national figure. The differential began to widen between 2014 and 2015, as the reforms were implemented. 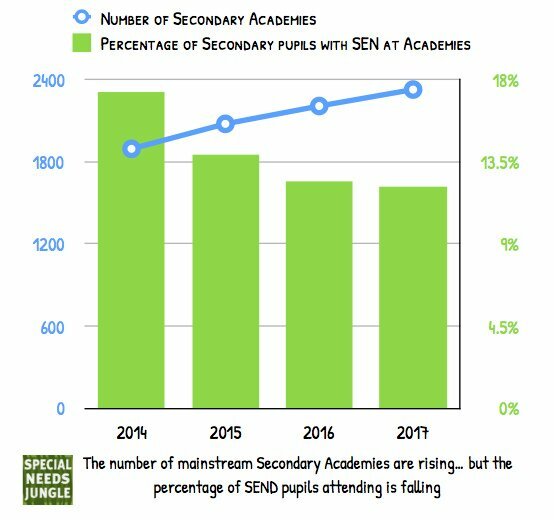 So, in answer to the question do mainstream Academies turn away children with SEND, posed by Malcolm Reeve on SNJ some time ago, the answer seems to be - YES - as our graphic shows clearly. So here is the graphic, illustrating the points already made. Feel free to download, print and share this and the graphic above, with credit to SNJ, of course. If you would like a printable PDF, you can get it by clicking here. You can find the stats for yourself on the DfE gov.uk website. What are your thoughts on the 2016 SEND in England stats? Have I missed something? Is my analysis incorrect? Let us know in the comments here on the blog. thank you for drawing my attention to the publication of the stats from the DfE. A couple of these graphics confuse me. It looks like primary schools are identifying increasing numbers of children with SEND (but not at EHCP level) but that secondary schools are seeing fewer of them. That would be counter to the longitudinal studies which suggest that SEND becomes more obvious at secondary school. It also looks as though the same trend is being followed at the level of EHCPs. More significantly, the increasing number of children with EHCPs attending special schools might suggest that the children with SEND missing from academies are going to special schools instead. That would be contrary to the Salamanca declaration. I always love stats. Especially your straight forward synopsis. Hope you took them to DfE this week along with the blue and purple hair! I expect 16,500 growth in no’s of pupils with SEN this year reflects the end of a period of settling out of over diagnosed low level needs which weren’t truely SEN, before and during the first two years of Reform. This moderate growth (offset for the last two years by settlement adovr) possibly now reflects more typical growth in the school aged population in general and of people living with more complex disabilities and illnesses. I wonder if school budgets will increase cope with this growth? Parents given up on the system and home-educating? The neurodiversity movement claiming ASD as a ‘gift’ and not a disability? Parent-blame culture among professionals, meaning parents believe their child’s difficulties are their fault not because of a neurodevelopmental condition so not seeking diagnoses (we all know support is almost impossible to get without a diagnosis, therefore wouldn’t be labelled as SEN)? interesting that diagnosis will be attachment disorder – no doubt to blame the parents and increasing number of young people being detained under the MHA 1983.
can I bring it to your attention Tanya that ALLFIE has managed to get a letter published in this week’s TES on school funding and elephant in the room – the impact of funding a parallel segregated education system. Do you have the juicy link? On a personal note I had a letter published in today’s I newspaper I response to their feature article on designer babies – I can email over you the link / tweet it to you from personal twitter account.